Short on time, but still want a savory meal the whole family can enjoy? This pork adobo recipe only takes 20 minutes of prep prior to letting your slow cooker take care of the rest. It’s also perfect as a meal you prepare and then freeze to use for a later occasion. We recommend taking it out of the freezer the day before and allowing it to thaw in the refrigerator so it reaches a safe cooking temperature quickly when slow cooking. Try serving this flavorful yet tender meat over rice, and make sure to prepare or save enough for leftovers: trust us — you’re going to want them! Add the cooking oil to a frying pan and work in batches to brown the pork cubes. Remove the pork from the pan and add it to the slow cooker, leaving the oil in the pan. Smash the garlic cloves and wrap them, the bay leaves and the peppercorns in cheesecloth. Use cooking twine to tie the spice bag and add it to the slow cooker. Heat the oil in the frying pan and add the vinegar and soy sauce to deglaze the pan. Pour the mixture over the pork in the slow cooker. Cover and cook on high for 4 hours or on low for 8 hours. Remove the spices before serving. 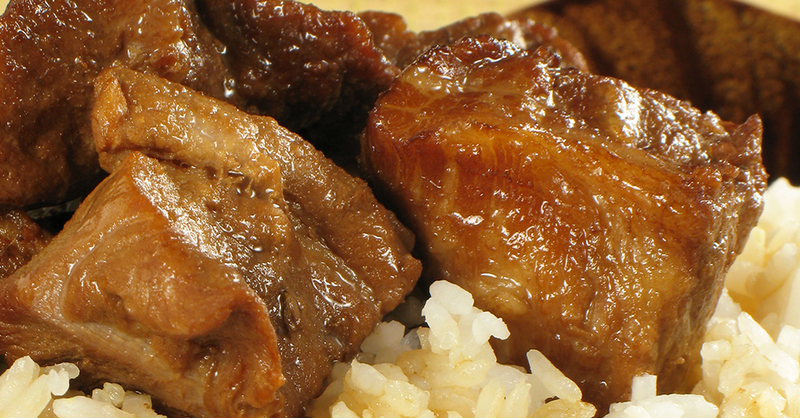 Place a bed of rice on each serving plate and top with the pork.